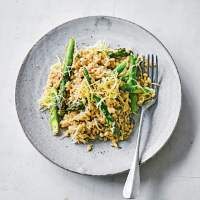 Plenty of other grains work well in risotto. Wholegrain spelt gives a nice, nutty texture, as does farro, a grain that's widely used in Italian dishes. 1. Trim the asparagus and cut in half. Cook in boiling water for 2 minutes, drain in a colander over a large measuring jug to keep 500ml of the cooking water. Whisk the bouillon into the jug. 2. Heat the oil in a saucepan and fry the shallots for 3 minutes. Tip in the garlic and pearl barley and cook for 2 minutes, stirring. Add the stock and cook over a medium heat for 20 minutes, stirring frequently. Add the tarragon and cook for a further 5-10 minutes until the risotto is thickened and the grains are tender. 3. Stir in the asparagus and nutmeg and cook for another couple of minutes, adding a splash of water if the consistency is dry. Serve in shallow bowls, scattered with grated Violife. You can make this recipe using a regular risotto rice. The cooking time will be similar, but add a ladleful of stock at a time as the rice cooks to give a creamy result. 1 of your 5 a day; high in folic acid.